Stand up to RWE - switch to clean energy! The RWE Group wants to clear the Hambach forest so that it can dig up even more coal -- but we don’t have to just sit back and take it! RWE is a partner of many other companies -- from Innogy, Eprimo and Rheinenergie to many municipal utilities. Many of us are their customers, so let’s all switch energy providers! Customers of other providers can join as well -- because many others also produce dirty energy. The only really sustainable option is green electricity. So join now and make the switch! And the best part: for everyone who switches, we get a bonus of between €15 and €40, which we’ll use to support the environmentalists in the Hambach forest and the fight against coal! For those who already have green electricity, share the campaign and spread it everywhere, so that as many people as possible see it! They’re living in trees - and have been for months. 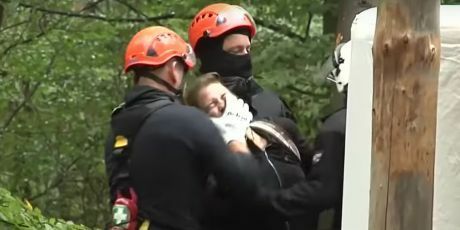 In a small forest near Cologne, a handful of environmentalists are resisting 4,000 police officers and the RWE Group, which wants to clear the Hambach forest so that it can dig up even more coal. They are all that's left standing between the forest and its destruction, the last line of defense against chainsaws and coal diggers. The struggle of the Hambach Forest is no longer just about 200 hectares of trees, it is about the future of our country and the question: coal power or climate protection? For the state government of North Rhine-Westphalia and RWE, the answer is clear -- they want to continue to mine coal for decades, regardless of the damage done to our environment. But we don’t have to just take it: RWE is the second largest electricity supplier in Germany and many of us are their customers! Together, we can stand up to RWE by switching to a clean energy company. You’re in? Click here and join in! The Hambach Forest was once larger than 5,000 football fields. Today there are only 280 football fields left of the oldest forest in the Rhineland - and half of that is about to disappear! For what? For an energy policy from the last millennium and the profits of RWE. If we are serious about climate protection, we can not allow that! Even those who already have green electricity can help by spreading this call everywhere and sending out the clear message that the age of coal is over -- once and for all. In the 1970s, it was the anti-nuclear movement, now it's the anti-coal activists: courageous people who stand up for all of us and oppose the interests of large corporations. Regardless of whether we ourselves participate in civil disobedience, these people deserve our respect and support! PS: On September 19, a journalist in the Hambach Forest fell from a great height and died. Our thoughts are with his friends and his family.The eviction was suspended after this tragic death, but has now been resumed. Avaaz is a 47-million-person global campaign network that works to ensure that the views and values of the world's people shape global decision-making. ("Avaaz" means "voice" or "song" in many languages.) Avaaz members live in every nation of the world; our team is spread across 18 countries on 6 continents and operates in 17 languages. Learn about some of Avaaz's biggest campaigns here, or follow us on Facebook, Twitter, or Instagram.